THE QUIREBOYS? Woah… these lads had released a successful debut back in 1990, right? They had clips on heavy rotation in the MTV, I can recall, and vocalist Spike really had a Rod Stewart-ish voice you could not easily ignore. I admit I have not tasted their post-90s albums and truth is I was not even aware the English band could still be around in this decade. Anyway, “Live In London” comes as a CD/DVD compact release featuring a gig the Glam Rock ’n’ Roll band gave at the legendary Marquee Club somewhere in 2002. 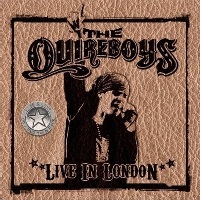 One thing I remember loving in THE QUIREBOYS was their ability to take the Rock ‘n’ Roll principals and filter them through their British origin not neglecting the era the “A Bit of What You Fancy” album originally came out (it was re-released last year with an added bunch of demo tracks). Without exaggerating on makeup, costumes or disorderly behavior, the band around Spike performed some vivid Rock with lurking moody melodies few bands in the UK could come up with at the time. I was lately informed about an impressive show the band had given in last summer’s ‘High Voltage’ festival in London, too. But what part of this gig was caught on film? The setlist owes a lot to the “A Bit of What You Fancy” debut plus there are also pieces from that year’s “This Is Rock ‘n’ Roll” ‘new’ release, with just one slot for a sample off 1993’s “Bitter Sweet & Twisted” follow-up. In any case, accusing them as a replica act seeing the boys onstage wouldn’t be off logic but –seriously speaking – THE QUIREBOYS are the kind of rock ‘n’ rollin’ band that throws good live parties and that’s the scenario on your screen. Guitars, piano and a bass/drums backup all aiming for a good time result in one hour of set dressed in a decent sound while the voice of Spike holds tight. The likes of THE FACES, MOTT THE HOOPLE, AC/DC and SLADE adjusted to the sonic needs of the 90s is something you cannot miss if a fan of this genre and truth is this sextetcan give it to you good. In between the songs there’s a lot of familiar chattin’ that adds to the gig’s atmosphere, we should also mention. I read somewhere “Live In London” does not have the official stamp of approval of the band…who knows? In any case this release stands out as a remarkable music film. The audio CD holds the exact same tracklist and – to cut a long story short – this combo is definitely value for money at a normal retail price, since no bonus good or heavy menu options are included here.